Crossroads' desire is to equip the body to love and know God and disciple others. The following tools are resources to use in your relationship with God as well as resources to use as you disciple others and help them know Christ more. Crossroads desires to help you discover the gifts God has given you and how you can be equipped to use them for God's purposes. We'd also love to know what those gifts are! Please follow this link to complete our spiritual gifts analysis. 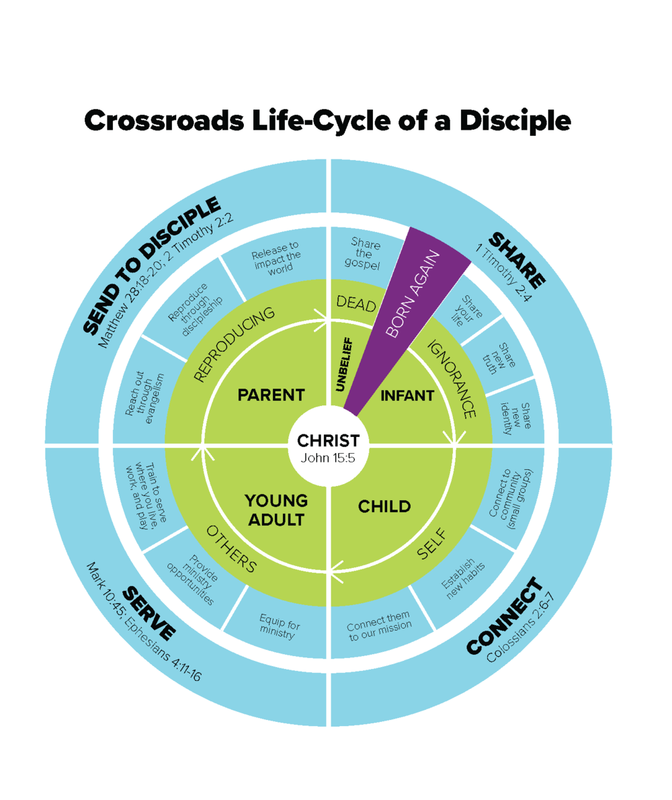 Our discipleship wheel is a great tool to use as you disciple others and as you assess where you are in your walk with God. To view or print this wheel, click on the button below. Disciples are people who follow Jesus, are changed by Jesus, and live on mission with Jesus. The following tools are more in depth resources to help you discover where you are and the steps you need to take in your relationship with Christ.